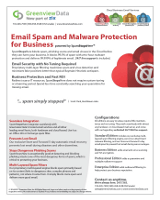 These White Papers delve more deeply into anti-spam filtering and blocking topics relating to SpamStopsHere. Feel free to download and share them. Ted Green, creator of SpamStopsHere, explains why URL filtering (based on the "click me" links in almost all spam) is the most accurate and predictable method of blocking spam, and why it delivers more legitimate email than Bayesian/Heuristics methods used by other anti-spam programs. A dangerous and common type of spam, known as phishing, tries to trick recipients into revealing sensitive data, such as login credentials and social security numbers. This white paper addresses current issues associated with phishing scams and the likely direction they will take in the future. This management-ready document focuses on the benefits and ROI of SpamStopsHere, rather than technical details. This datasheet focuses on features and technical details to help IT admins and others evaluate SpamStopsHere. Need the Free Adobe Reader?